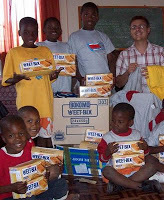 Our project partner near Cape Town, Helping Hand, majors on food programs for the poor, and in a typical year collects and distributes somewhere in the area $500,000 worth of food, clothes and other aid, in the townships around the Cape, as well as to poor institutions. When you see what goes into coordinating the volunteers who help to collect, sort, pack, clean and process every item that comes their way, and then deliver this to the given locations throughout the area, you can imagine this is no small job. Especially since in a given month this may include 10,000 pounds of food, 10,000 loaves of bread, 3,000 pieces of clothing, and 2,000 pairs of shoes, baby strollers, educational books and more. The first day we visited a program that Helping Hand has been involved with in the Township of Wallacedene for over a dozen years, during which time an estimated 2.5 million meals have been fed to the poor who live here. In addition to the feeding program, we also toured an IT training center created inside a 40-foot shipping container, a library incorporated inside another metal 40-foot container, an orphanage and daycare center attached to the facility, all of which provide valuable resources to this impoverished community. The following day, we visited other programs that Helping Hand is involved with including a HIV-AIDS clinic, a children’s hospital, a daycare center and a home for abused women.